AMD plans to begin shipping its Ryzen Threadripper processors and motherboards early next month. Engineering samples are already in the wild and fortunately for us, one recently fell into the lap of Roman Hartung (better known in the enthusiast community as Der8auer). The well-known overclocker decided to remove the chip’s integrated heat spreader (IHS) – a process known as delidding – in order to have a look at what’s going on under the hood. 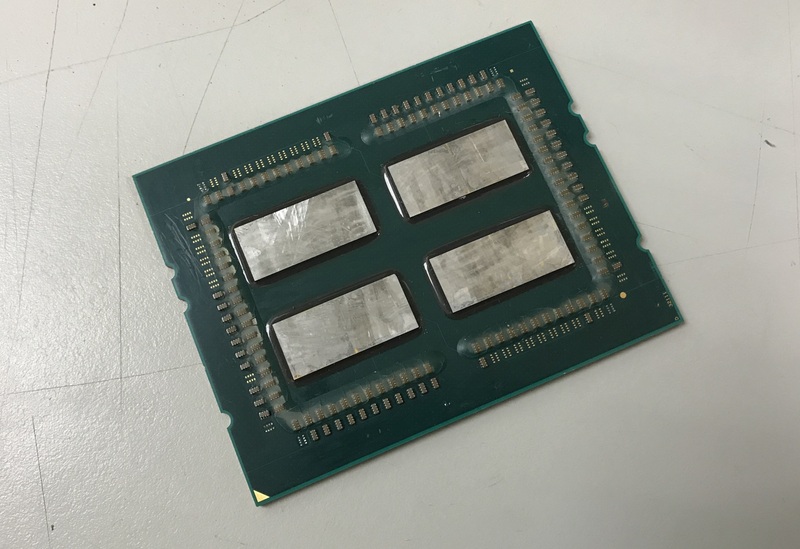 The IHS on Threadripper is soldered directly to the dies underneath, further complicating its removal. Although Der8auer ended up killing the processor, its sacrifice was well worth it as we learned that Threadripper is hiding four (not two) dies under its IHS. When probed for comment, AMD told him that Threadripper is based on its Epyc line of server chips (hence the extra dies). This of course begs the question… can the additional cores / dies be unlocked?